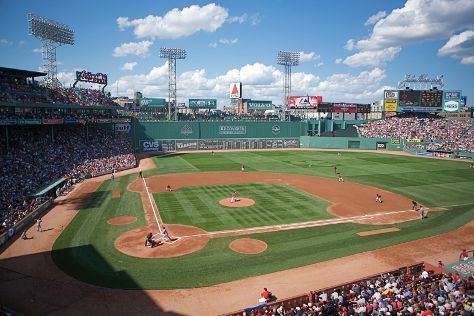 Family-friendly places like Fenway Park and Boston Public Garden will thrill your kids. Change things up with a short trip to Dolphin & Whale Watching in Gloucester (about 50 minutes away). There's much more to do: admire the masterpieces at Museum of Fine Arts, get engrossed in the history at USS Constitution Museum, meet the residents at New England Aquarium, and tour the pleasant surroundings at Boston Common. Manchester, UK to Boston is an approximately 10-hour flight. Due to the time zone difference, you'll gain 5 hours traveling from Manchester to Boston. Traveling from Manchester in July, expect Boston to be somewhat warmer, temps between 33°C and 22°C. Wrap up your sightseeing on the 19th (Fri) to allow time to travel to Edgartown. Edgartown is a town located on Martha's Vineyard in Dukes County, Massachusetts, United States. Kick off your visit on the 20th (Sat): stroll through Norton Point Beach, don't miss a visit to Flying Horses Carousel, then admire the striking features of Trinity Park Tabernacle, then visit a coastal fixture at Edgartown Lighthouse, and finally take in the architecture and atmosphere at St. Elizabeth Catholic Church. Keep things going the next day: enjoy the sand and surf at Menemsha Hills, then enjoy the sand and surf at Menemsha Public Beach, and then admire the natural beauty at Mytoi. For traveler tips and more tourist information, refer to the Edgartown trip itinerary planner . Traveling by combination of car and ferry from Boston to Edgartown takes 3 hours. Alternatively, you can fly; or do a combination of bus and ferry. In July, daily temperatures in Edgartown can reach 30°C, while at night they dip to 20°C. Finish your sightseeing early on the 21st (Sun) so you can travel to Falmouth. Falmouth is a town in Barnstable County, Massachusetts, United States; Barnstable County is coextensive with Cape Cod. Kids will enjoy Sandwich Glass Museum and Old Silver Beach. Explore the numerous day-trip ideas around Falmouth: Plymouth (Plymouth Rock & Plimoth Plantation), Cape Cod Canal (in Buzzards Bay) and Sandwich (Heritage Museums & Gardens & Hoxie House). Next up on the itinerary: explore the landscape on two wheels at Shining Sea Bikeway, explore the world behind art at Highfield Hall & Gardens, enjoy the sand and surf at Craigville Beach, and tour the pleasant surroundings at Gray's Beach. To find photos, reviews, where to stay, and more tourist information, read our Falmouth trip itinerary planner . Getting from Edgartown to Falmouth by combination of bus and ferry takes about an hour. Other options: do a combination of car and ferry. Expect a daytime high around 31°C in July, and nighttime lows around 20°C. Wrap up your sightseeing on the 24th (Wed) to allow time to drive to Provincetown. 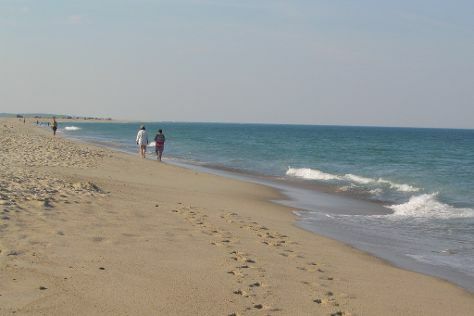 Family-friendly places like Cape Cod National Seashore and Nauset Beach will thrill your kids. Step out of Provincetown with an excursion to Salt Pond Visitor Center in Eastham--about 42 minutes away. The adventure continues: tour the pleasant surroundings at Race Point Beach, examine the collection at Provincetown Art Association and Museum, get lost in a book at Provincetown Library, and appreciate the history behind Pilgrim Monument & Provincetown Museum. To find photos, other places to visit, maps, and other tourist information, go to the Provincetown visit planner . Drive from Falmouth to Provincetown in 2 hours. Alternatively, you can take a bus. July in Provincetown sees daily highs of 30°C and lows of 20°C at night. Finish your sightseeing early on the 28th (Sun) so you can travel back home.